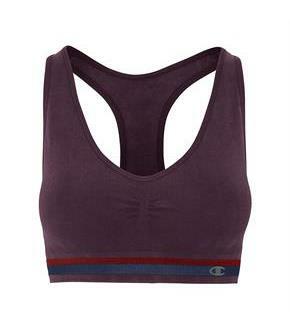 Cottony soft Racerback Sports Bra strikes the perfect balance between support and vintage athletic style. Double Dry technology wicks sweat away from skin to manage moisture and keep you drier. All-over stretch and no seams help minimize chafing. Moderate Support bra with removable cups for shaping and modesty. Cotton-rich fabric with stone-washed finish for a vintage look. Signature stripe knit-in band for authentic athletic style. Slight variations in color occur due to stone-wash process. Pullover racerback bra coordinates with our Vintage Dyed Tights.